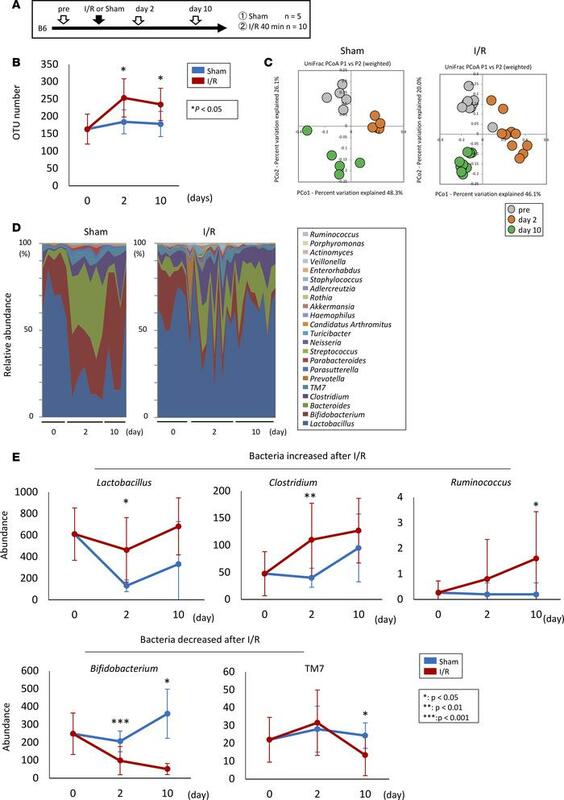 AKI-induced gut dysbiosis in the mouse I/R model. (A) The protocol for I/R injury in mouse kidney. (B) Comparison of species richness between the gut microbiota in the I/R-injured and the sham-operated mice. (C) Principal coordinate analyses (PCoAs) based on the weighted UniFrac analysis of the bacterial community structures before the induction of I/R (pre) and on days 2 and 10. (D and E) Comparison of the bacterial composition (D) and the abundance of several species (E) between the I/R-injured and the sham-operated mice before I/R and days 2 and 10. Data are presented as mean ± SEM. Statistical analysis was performed using Student’s t test (B and E). *P < 0.05, **P < 0.01, ***P < 0.001. OTU, operational taxonomic unit.